Used by many wardrobe door manufacturers. 3/8"OD x 1"H nylon base and 19/32"OD x 7/16"H nylon cap. 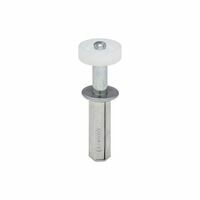 Spring-loaded, self-adjusts from 1-7/16"H to 2-1/16"H. National Hardware Folding Door Top Roller, Series: V391GR, Suitable For Use With: Door Frames, Steel, Plastic, Zinc Plated, BHMA A138.18 Fits Cox doors, 1" to 1-3/8" thick, bi-folding doors up to 30 lbs. each; nylon base.